Most Vulcan air/steam hammers are single acting, i.e., they rely exclusively on gravity during the ram drop to produce the kinetic energy–and thus the velocity–to drive the pile. Before World War I Vulcan had developed the #5 and the California series of hammers that gave the ram “downward assist” during descent, but the Super-Vulcan Differential-Acting hammers were the best known–and certainly the most widely used–pile drivers Vulcan produced that featured downward assist. Although most people equate the Super-Vulcan line with the “C” hammers, there are actually two series of differential acting hammers, the first closed and the second open. 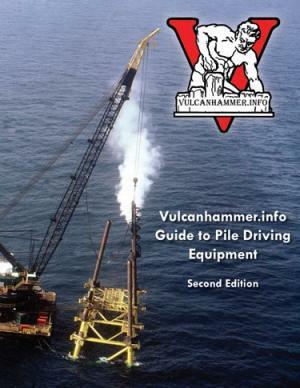 Specifications for both are found in the Vulcanhammer.info Guide to Pile Driving Equipment. Although James Warrington had proposed designs different from the Warrington-Vulcan hammers, the final design of the closed differential hammers was by Campbell V. “Doc” Adams, Vulcan’s designer for most of the twentieth century. The operating cycle for these “differential acting” hammers is shown. The lower side of the piston is always “live” (with steam or air pressure.) At the beginning of the cycle (left diagram,) this pressure forces the ram up to what is the “cut-in” point (as opposed to the “cut-off” point with single-acting hammers.) The top of the piston is then pressurised, bringing the ram to a halt at the top of the stroke (right diagram.) The ram is then accelerated to impact by both the force of gravity and the net downward pressure on the piston. Just before impact the valve is turned, exhausting the pressurised air or steam and beginning the cycle once again. In addition to the Super-Vulcan hammers, the DGH series of hammers also used the differential acting cycle. They were “differential acting” as opposed to single-acting hammers. This was also a departure from the double acting hammers such as the “B” series MKT produced. The differential acting principle allowed the use of the same type of Corliss two-way valve while producing downward assist, which simplified the valving considerably. They were a “closed type” hammer as opposed to an open type one. Almost all of Vulcan’s competitors at the time (MKT, Union/Arnott, etc.) manufactured closed type hammers, i.e., ones where the ram and other moving parts were inside an enclosure, thus invisible to the user. The advantage to this was that a closed type hammer could be run underwater (but click here for an open type hammer that can be run in this way.) These hammers are also simpler to run without leaders, which is advantageous with sheet piling. They had about twice the blow rate of the single-acting hammers, approx. 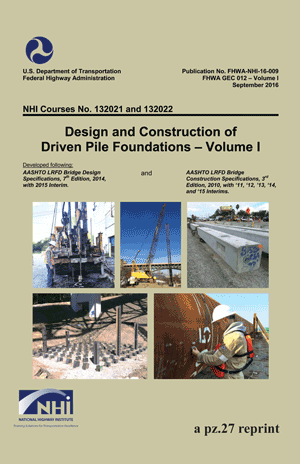 120 blows/minute as opposed to 60 blows/minute, which (in theory at least) increases production of pile driving, important in an era when many relatively small piles were driven for a foundation. One way where the Super-Vulcan hammers were not an innovation is in their “equivalent stroke.” Vulcan single-acting hammers maintained a drop of no more than approximately 1 metre (and less with the #1 and smaller.) By limiting the velocity, the impulse shape had a lower peak force but was more sustained. 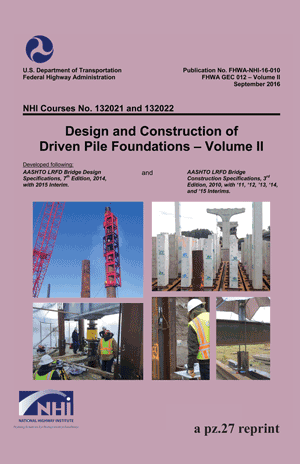 This lowered pile driving stresses, especially important in the precast (and later prestressed) concrete piles that were becoming popular. 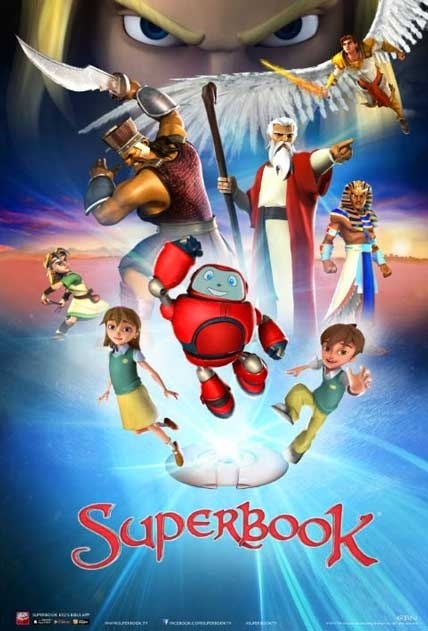 (This issue is discussed in more detail here.) Vulcan could have increased the impact velocity with these hammers but did not. The closed type hammers opened up new and interesting possibilities for hammer-pile interface as shown below. A 3000 hammer (with, amazingly, a 3000 lb. ram) is shown set up for sheet piles, either in the leaders (left) or using “pants” and without leaders (right.) This opened up possibilities for larger Vulcan hammers that were previously best done with the California series of hammers. A closed type Super Vulcan hammer on a pile driving rig owned by the Driven Pile Foundation Company, San Antonio, TX. 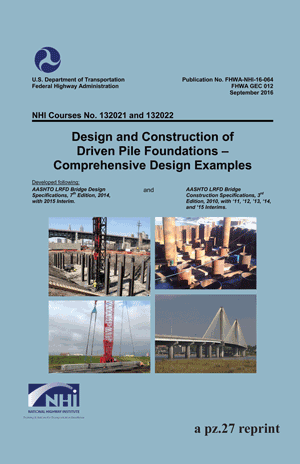 Evidently the piles are be driven for one of the military bases in the San Antonio area. Note the use of the Gardner-Denver air compressor; in the 1930’s, air was already beginning to be used more as a way of powering Vulcan hammers. As with hammer cycles, timing is everything, and these hammers ended up being sold into the great depression of the 1930’s, which in turn depressed sales. Beyond that, some of the innovations these hammers featured did not fare as well in the market as one would like. To start with, the cast enclosure was expensive to manufacture, more so than the ram/column/base frame structure of the single-acting hammers. Beyond that, the open hammers, Vulcan’s “signature” so to speak, had one key advantage: one could see the ram stroke, which was another method of verifying the energy output of the hammer during operation. In addition to putting piles in the ground, impact pile drivers were (and are) used as a measuring tool to verify the load capacity of the pile, which is problematic if one doesn’t know the energy output of the hammer. Open hammers are also easier to maintain because the working parts are easily accessible, a major advantage to the contractor. By the end of the 1930’s Vulcan bowed to market pressure and introduced open type differential acting hammers to the market. (An early concept of this is here.) The closed configuration was tried once more in the 1950’s with the “Mariner” hammers, but didn’t get very far either. At first glance, the open-type Super Vulcan hammers (the “C” hammers, for 100, thus the sizes 30C, 50C, 80C, etc.) were similar to the single-acting hammers. 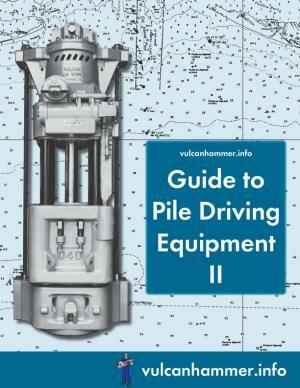 (Specifications are found in the Vulcanhammer.info Guide to Pile Driving Equipment.) However, many detail changes were made, including the elimination of rubber bumpers, a different style of piston rod/ram connection, and others. In general the hammers were built with more material in the frame than their single-acting counterparts. The smallest of the Super-Vulcan open size hammers produced, the 18C, with a ram weight of a mere 1,800 lbs. Like parent, like child, but the size is reversed: a Vulcan 030 single-acting offshore hammer and a Super-Vulcan 30C hammer, side by side, at the plant in Chattanooga. Note the constructional similarities. The hammers were successful; they were certainly faster than the single-acting hammers and had the traditional Vulcan reliability. But they never displaced the single-acting hammers for several reasons. The first was that the additional speed brought with it higher air or steam requirements, thus a larger boiler or air compressor for a given hammer energy. Given the contractor and the type (and amount) of work they had, the expense of a larger prime mover wasn’t always worth it. The second concerned the controversy over Vulcan’s charts of hammer blow rate vs. energy. This is discussed here, but the aftermath of this was that engineers frequently didn’t trust the energy output of the Super-Vulcan hammers. This problem was compounded by the fact that Vulcan hammers weren’t designed to require rebound to achieve their full stroke (unlike the diesel hammers.) Once rebound became significant during driving, it was necessary to reduce the pressure (and thus the output energy) to avoid overstroking. The third was that the high speed of the hammer, while keeping the piling moving (especially important with cohesive soils,) wasn’t always the easiest for the crane operator to keep up with. One of the larger differential hammers produced, the Vulcan 200C, with a ram weight of 20,000 lbs. The upside of this, however, was that using a “C” type frame yielded a very rugged platform for the offshore hammers such as the 014, 016, 020, 030, 040 and 060. The Super-Vulcan hammers represented an important development in the Vulcan hammer line.